RadScheduler's Timeline view allows you to display appointments in horizontally arranged time slots. Consequently, time slots can be configured by duration and the time scale can be set for minutes to years. User capabilities include creating, adding, and modifying appointments at run-time, appointment and cell selection, resizing, drag and drop, keyboard navigation, a customizable timeline context menu and resource grouping support. To move to the next day or previous month, you can use the back and forward keyboard arrows, or the SchedulerNavigator control. The Timeline View of the scheduler simply has a Header, Columns for every hour/day/week/month and zero or more Appointment Cells. This method returns null if the active view of the scheduler is not SchedulerTimelineView. The time range that the timeline shows can be set with the RangeStartDate and RangeEndDate properties, where RangeEndDate must be bigger than RangeStartDate. The scheduler will not be able to navigate outside this range. 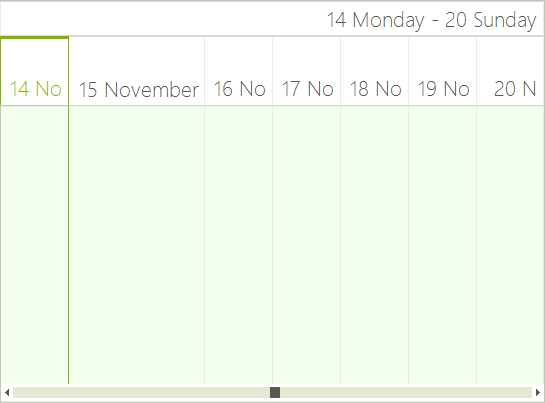 The StartDate property sets the first date that is shown in the timeline RangeStartDate and RangeEndDate. The default time scale can be set to any of the predefined values, or the user can select a new scale by simply right-clicking in the time table and selecting the preferable setting from the context menu. To get the currently selected scale, use the GetScaling method. After this you can modify properties of the current scale such as the Format property, which specifies the date-time format of the header cells, and the DisplayedCellsCount property, which specifies the number of cells to be displayed in the view. In TimelineView there are two scrollbars which stand for navigation between dates and scrolling through appointments. The horizontal one allows you to scroll fast through the dates in the range specified by the RangeStartDate and RangeEndDate properties. The vertical one appears when there is a cell which contains more appointments than it can fit. This scrollbar allows you to scroll the presenter area so you can view the appointments. You can show or hide any of these scrollbars by using the following properties. The SchedulerTimelineViewElement allows you to specify different size for the different columns. To manipulate the size of the columns, you can use the SetColumnWidth and GetColumnWidth methods. The values passed to the SetColumnWidth method are proportional and the actual width of the columns is calculated based on them. By default all columns have a value of 1 and therefore if you set a value of 2 to any column, it will stay twice as bigger compared to the others. TimelineView contains two header rows. The first one displays the date range of the view that is currently displayed. The second one holds the header cells for each column and each of them displays the date that corresponds to this column. You can modify the height of both of these headers by using the following properties of the SchedulerTimelineViewElement. The following picture demonstrates the result of setting the header sizes and resizing the column with index 1.